The San Jose Sharks are coming off what was a nightmare schedule. The Sharks went through a four-week stretch with only one game in the same venue as the prior game. They even had a home game sandwiched between road games against the Montreal Canadiens and Dallas Stars. Yikes! When the Sharks finally returned home, the league didn’t make it easy for them to find a rhythm. They played a Thursday game at 7:30 pm, a Saturday game at 1:00 pm and a Sunday game at 5:00 pm. Alas, they only added two points in the three games. Still, there is good news in all this. The Sharks survived the stretch between Thanksgiving and Christmas with their spot in the standings intact. The team sits second in the Pacific Division, trailing only the Calgary Flames. What comes next for the Sharks is a critical eight-game stretch. Seven of their next eight games are against teams sitting in a playoff spot. Five of the seven games are against teams in their division: the Anaheim Ducks, Edmonton Oilers (twice), Vegas Golden Knights and the Flames. Just eight points separate the top team (Calgary) from the bottom team (Edmonton) in this group. The other three games are against the Los Angeles Kings, who just beat the Sharks in overtime, the Colorado Avalanche with a similar record as San Jose, and the Tampa Bay Lightning with the league’s best record. Among the eight upcoming games, the only one against a team not in playoff spot is against the Kings. The Sharks are in a good spot at the moment, despite having lost their last three games, although two went to overtime. This is a good time to turn the season positive. A strong run here, say 13 of 16 points, would put the Sharks in an enviable position for the rest of the season. Holding their own, perhaps 10 points, will leave the team in the mix, but without much room for error. If they under-perform and earn 7 points, they’re most likely looking up at a playoff spot. The Sharks looked like a team who needed time off and the Christmas break might just do the trick. This team succeeds when it is strong on details and the last few games haven’t been good on this front. I’ll cover one such important moment, late in the loss to the Winnipeg Jets last Thursday. It proved the difference in the game. With the score tied at three, and three minutes left in regulation, two Jets, Mark Scheifele and Blake Wheeler, entered the offensive zone. 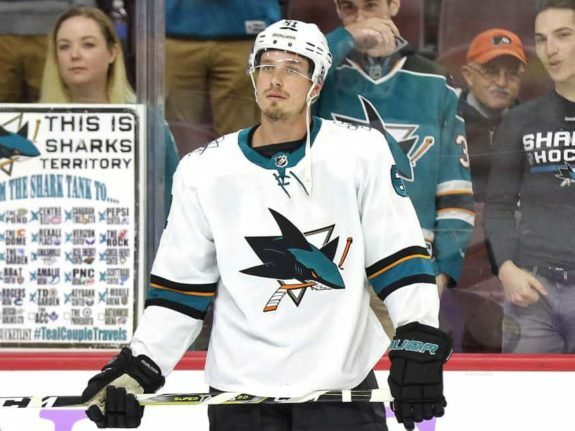 Two Sharks defenders, Marc-Edouard Vlasic and Justin Braun, lined up against them. For some reason, Braun started to double-team the puck carrier, Scheifele, who was being handled by Vlasic. Against a skilled Jets team, this was the first in a cascade of Sharks errors. Braun’s move left Wheeler undefended and, sure enough, the puck was quickly sent to him. As a result, Sharks goalie Martin Jones was left to face Wheeler one-on-one. Jones came out of his crease to take away the shot and succeeded. Momentarily. Jones’ decision forced the attacker behind the net. As that happened, Braun bumped into Jones, taking both players out of the play. Disaster? It didn’t have to be. Wheeler went behind the net with the puck, threatening a wrap around. But the Sharks had the far post covered to defend against it. Too covered, in fact, as three defenders went to the same area. Even with Jones and Braun out of the play, the Sharks still had four players inside the dots. As the play went behind the net, the Jets had two players still outside the blue line, and a third had just barely entered the offensive zone. Were these three out of sight, out of mind? It sure looked that way. None of the Sharks players even glanced to see what was happening behind them. As Nikolaj Ehlers entered the offensive zone – and because no one was looking his way – he found a soft spot in the defense. The Sharks were watching the puck instead of playing assignments. The pass went to the late-arriving Ehlers, who fired home the game-winning goal. Fatigue shows up physically and mentally. The challenging period between Thanksgiving and Christmas is the sort which can sap a team on both fronts. For the Sharks to play their best, getting the details right matters a bunch. It didn’t happen in the key moment against Winnipeg, but this doesn’t need to become an ongoing theme. Perhaps the break, coupled with a week at home, can refresh and re-energize the team. Erik Karlsson earned a two-game suspension in the Saturday game against the Kings for a head hit on Austin Wagner. He’ll have to serve the second game of the suspension against Anaheim on Thursday, meaning he’ll have a full week off. That might be a blessing in disguise, as the Sharks will ride him heavily the rest of the way. He’ll come back focused and ready to play a major role. The rest of the team needs to get back the focus, which helped them win seven of eight games earlier in December. The Sharks have been streaky as of late, losing four games, then winning seven of eight before the current three-game losing streak. The upcoming eight-game stretch ends on Jan. 10 in Las Vegas. This can help the Sharks a lot, help them a little, or take the team out of a playoff spot. Which Sharks team will show up for this critical stretch? We’ll know soon enough. Joe Thornton, who seems to hit some sort of milestone every few games, hit a major one recently, first tying, then passing Marcel Dionne for 10th place all-time in assists. Next up is Gordie Howe. 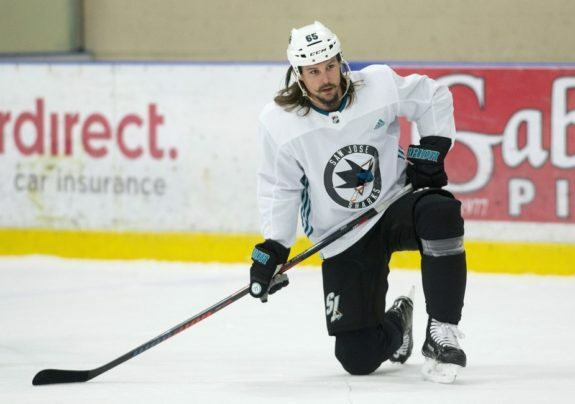 He’ll need eight to tie and nine to pass Howe, something which could reasonably happen by the time the All-Star Game is played in San Jose in late January.